Do you remember Esbit? No? Then it is time to refresh your memory as I will enlighten you about a wonderfully light and efficient fuel, which is easy to handle and allows you to create SUL cooking setups as well as bake fancy foods on the trail. The first time I used an Esbit stove was in 2004, when I was on a road trip to the Nordkapp in Norway with my brother. He gave me a Germany Army Esbit folding stove earlier that year, and as we decided to travel to the most northern point of Europe I thought it might come in handy and took it along. We indeed used it on that trip, on a windy day down in a Fjord, and we tried to cook Ravioli in a can on it. We ate lukewarm and burned Ravioli that day, and since then I haven’t used Esbit that much. It wasn’t until I started to lighten up that I was again using Esbit. 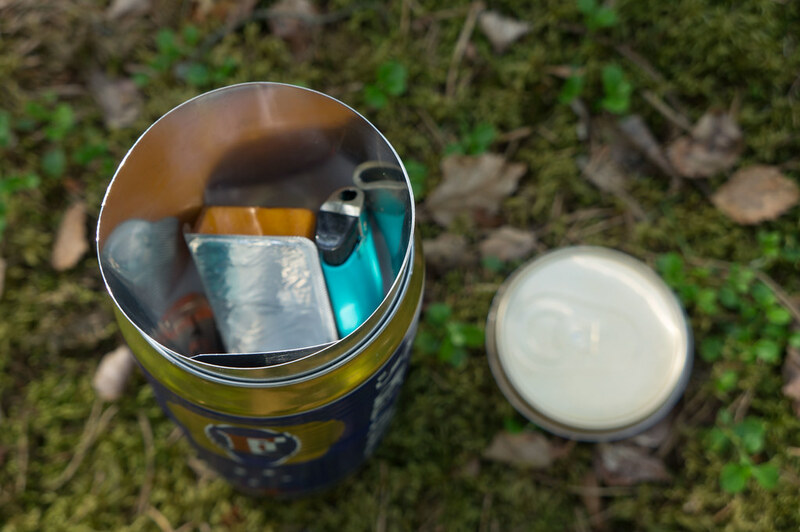 My Ti-Tri Caldera came with the Gram Cracker Stove, TrailDesign’s super-light Esbit stove, and I gave it a few tries back then, but preferred wood as fuel (don’t need to carry it, abundant, doesn’t cost anything). I still carried some Esbit, though - as I wasn’t yet as proficient in starting a fire I always had an Esbit tablet as a back-up - it’s dead easy to lighten even on a windy and rainy day, and could be the difference between a cold and a hot meal. A tablet weighs 14 gram including packaging, so it’s a light and reliable back-up in my opinion (in winter I still carry a tablet or more depending on the length of the trip). It wasn’t until the Ultralight Summit and seeing both Jotaro & Tatsuya use a wonderfully light and easy setup which used Esbit as a fuel, that I became interested in it again. Back at home I started to do research, harassed Tatsuya to write a blog post about his setup, and sent an unreasonably high amount of Euros in exchange for 81 grams of Titanium to some Ultralight Outdoor Gear webshop in the UK. After an equally unreasonable long amount of time the ultralight parcel of joy arrived at my door, and it was with much horror that I needed to realise that you can’t even trust an ultralight webshop anymore, as my Esbit Ti-Wing stove was a mighty 27% over the claimed weight - 14 g instead of 11 g it was supposed to be (further research has shown that these stove are usually 14 g and we’re being treated like dumb customers). After I recovered from this massive disappointment, which fellow ULers will certainly understand, I headed outdoors to have a cup of coffee to calm my nerves. Living in a coastal town means we’re blessed with a stiff breeze all the time. You just don’t want to go outdoors with at least a windshirt, and you don’t want to use a stove without a windscreen either. So I rummaged through a box titled “Kitchen Stuff” to find a windscreen I could use with my new stove and pot. Happily the Clikstand had a suitable windscreen, and so I set off to boil myself with the 14 g stove a cup of hot water for a coffee. Despite that stiff breeze and the slightly oversized windscreen I was stirring the Starbucks Via coffee in my titanium cup with my titanium spoon six minutes later. 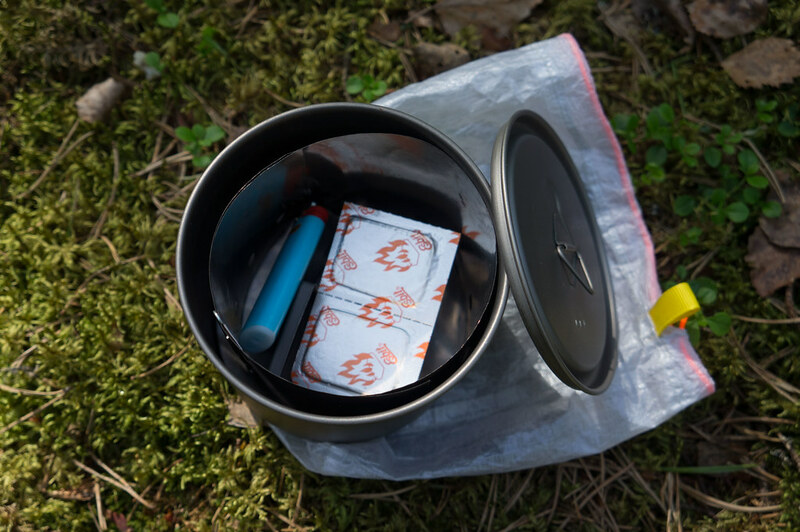 After a few more minutes I had recovered from the shock of the heavy stove and was content about this easy setup; a stove, spork, windscreen, lighter and a few Esbit tablets fit without problems in the cup, which in turn fits well into one of the small cuben sacks I had lying around. A fine Gentlemen even sent me some titanium foil so once I get around to it I could even make a lighter windscreen and a pot lid, making it even lighter and more efficient. Well, the post was fast for a change and one landed in front of my door in no time. I didn’t bother taking it in, but went straight out to boil some water for another coffee. Then it didn’t take long and plenty of snow, -20°C and darkness arrived. It’s wonderful how things sometimes conspire against me, but I deal with it. I sit tight, watch the moon, wait for the sun, and as soon as the snow is melted and the grass is still brown I head out to give it a run for its weight. And it is in spring just as fantastic as it was in the autumn. 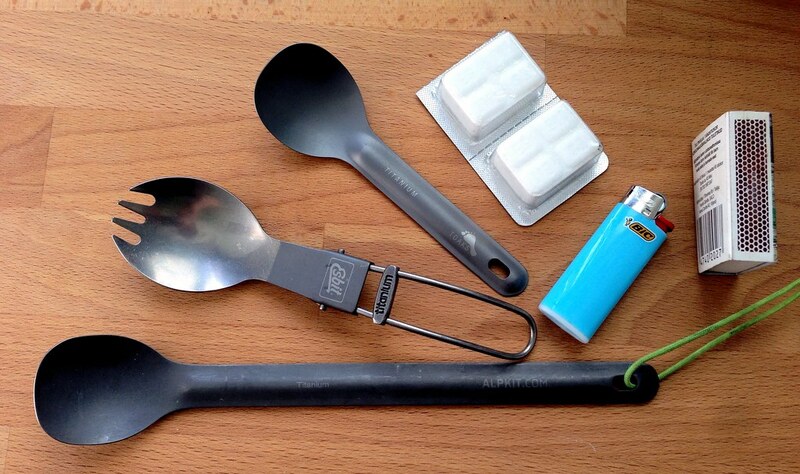 Again, everything fits inside the pot, including a lighter, a foldable spork or a short spoon as well as three to five Esbit tablets. But could it be lighter still? I couldn’t help but wonder. Well, I’m happy to inform you that it is possible. The answer is the Caldera Keg-GVP Stove System. It’s what Glen Van Peski uses. Once I started to explore Esbit stoves there was no way to not try it. As with the above systems, everything fits into the pot - or Fosters Can, in my case. Additionally also plenty of Esbit tablets, a Bic lighter, some Starbucks Via and a foldable spork fit inside, though unlike the two Ti pots above you need to be careful with the pot - but because you’re reading this I imagine you know how to take a bit care of your gear and don’t throw stuff around camp in a fit of anger because you again forgot your spoon. The next revelation about Esbit came when I set out to bake a muffin with my Flat Cat Gear Bobcat system. 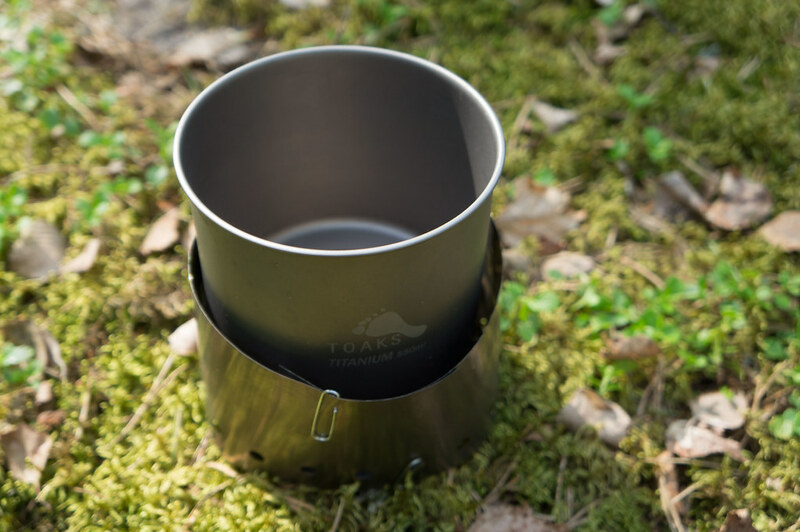 Flat Cat Gear has an Esbit stove called Epicurean Classic, and it allows you to let a single tablet burn for 50+ minutes. That. Is. Awesome. 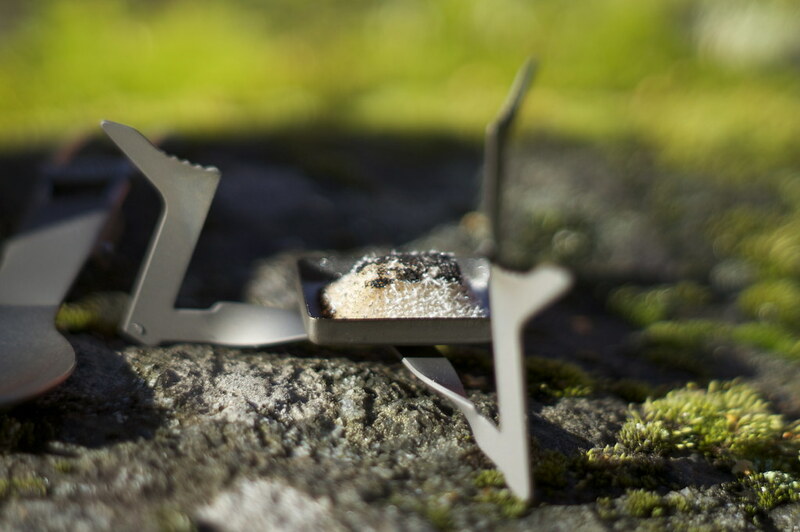 The Flat Cat Gear stove is otherwise an outlier in this article as it is, ähem, not light. As in 382 gram for the whole setup. 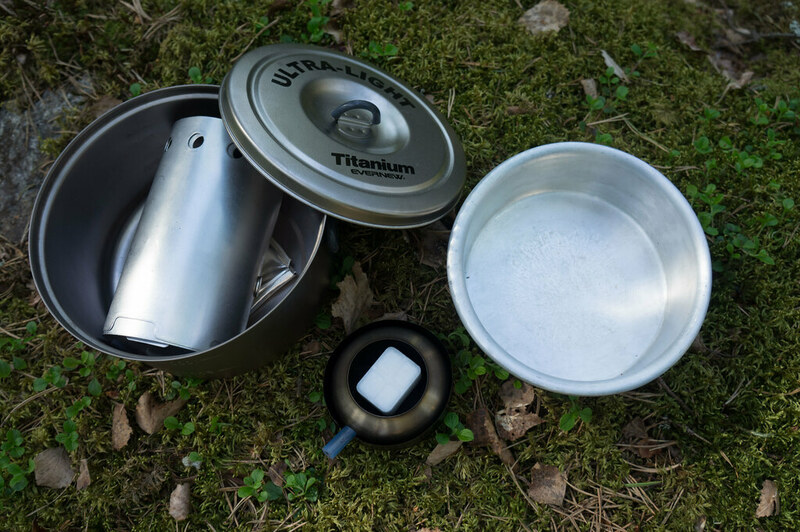 As in You will carry that nevertheless to be able to cook muffins, cakes, and bread on the trail - and to put things in perspective, it’s still 2/3 lighter than a Trangia. And it can make MUFFINS! What’s the right pot size? Does it need a handle? Does it need to be Titanium (Dumb question, of course it needs to be!)? The Trangia generation might look in disbelief at you if you get out your 550 ml coffee cup at the camping ground and declare that your pot. But then you hiked 35 km today, saw the sunrise from the summit while the Trangia user had a in-depth look at his shoes and the trail for five hours. At least he has two pots and a pan, he might think*. Anyway. 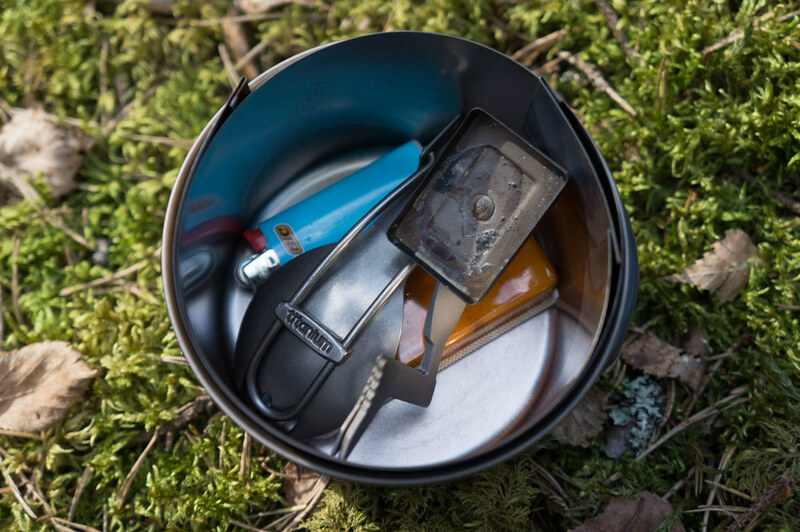 Once you go light you most likely will look at ways to minimize the heaviest item in your pack: Food. Dehydrated meals save space and weight, and can be delicious. You also minimize the time used to prepare a dehydrated meal: Boil water, pour in bag, let it rehydrate, eat. To rehydrate a meal one needs usually between 250 - 400 ml of water, and the small cups above all fit that bill. The Evernew EBY-265 I bought has 400 ml volume, the LiteTrail pot 550 ml and the Trail Designs Keg 700 ml. 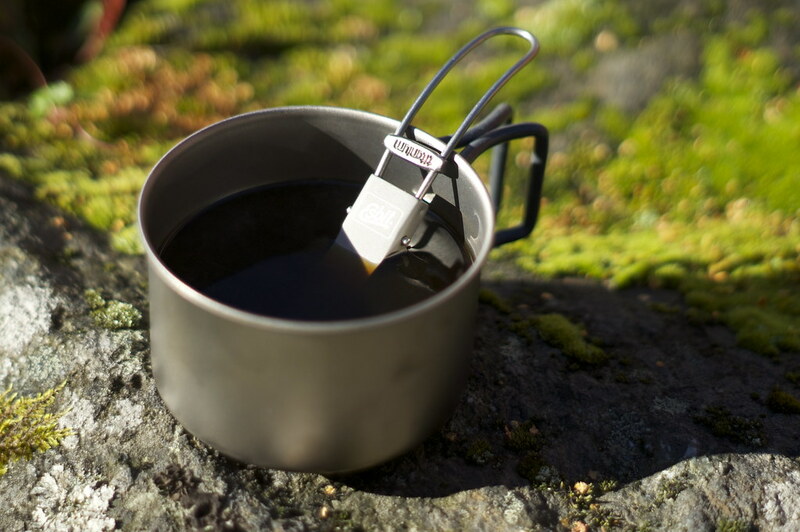 With the Evernew you likely will need to boil two cups for a rehydrated dinner and a cup of coffee/ tea/ cacao, while with the Fosters Can one is sufficient - the LiteTrail one is in-between - it could be enough for drink & food, or you might need to cook water twice. With a 14 g Esbit tablet burning between 10 and 15 minutes, it has been enough for me to boil two servings of water on the smaller pots, or one Fosters can. I eat from my cup/ pot or the freezer bag/ Ziploc directly, and also drink from it if I don’t take my Kuksa. It means if you want to eat from the cup you can’t drink a coffee from it at the same time, but with a bit of planning and thinking I’m sure you’ll cope. Or you take an extra cup =) A spoon, aka the-most-forgotten-backpacking-item-EVER is quite useful to eat, stir food and drinks, or even function as a pot handle. A lighter or matches make putting a Esbit tablet on a lot easier, apparently one could do it even with a firesteel (shaving a few bits of a corner and trying to ignite them) though if I use Esbit I do prefer one of the easy fire sources. The Foldable Spork is a great piece of kit because its a) a good length to eat from freezer bags and b) it folds so small that it fits in every of the above system - that minimizes the risk of going out without a spork! 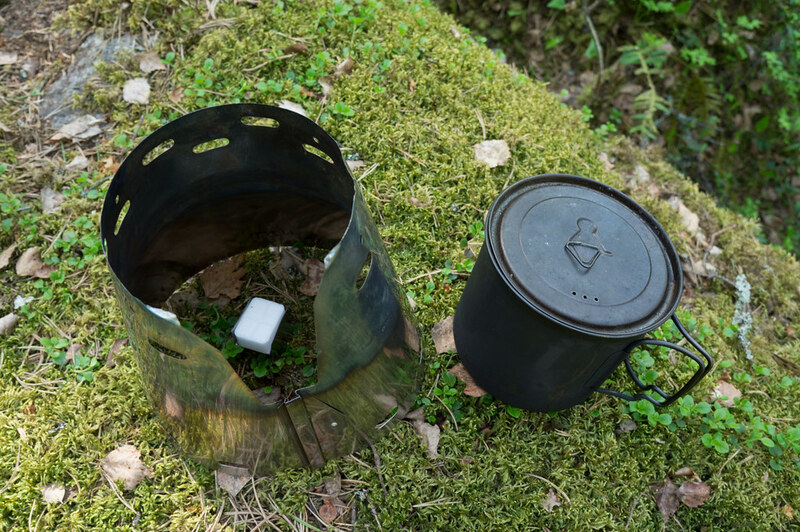 As you can see, an Esbit stove setup allows you to go ultralight - or even SUL - with ease. 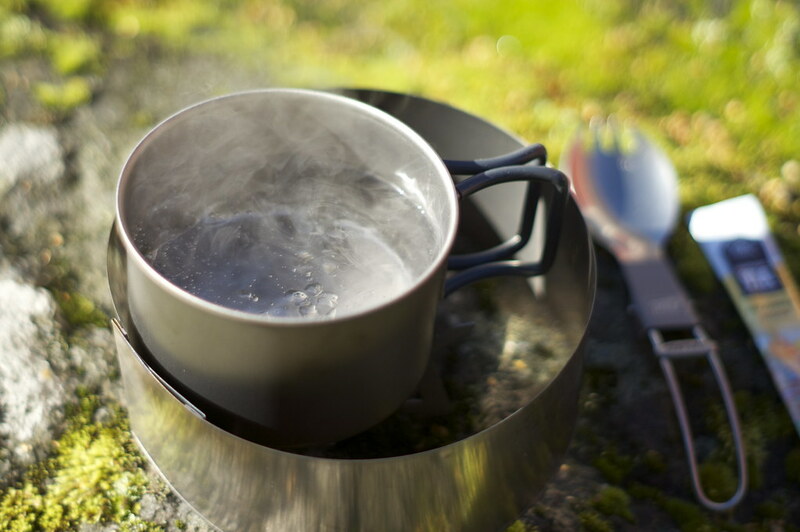 It’s a very convenient fuel source, and despite some of its criticisms - some find it smells fishy, it can leave sticky residues on the pot, a bit of garbage from the tablets packaging - I think it is a superb way of cooking/ heating up water on the trail. The fuel is reasonably priced - Esbit tablets cost between 4€ and $7 depending where you buy for twelve tabs - that’s an average price of $0.45 per tablet/ 1 l of hot water. Which SUL system to get? That’s a good question. You could go the MYOG route and pick the different components on your own to suit your specific needs. 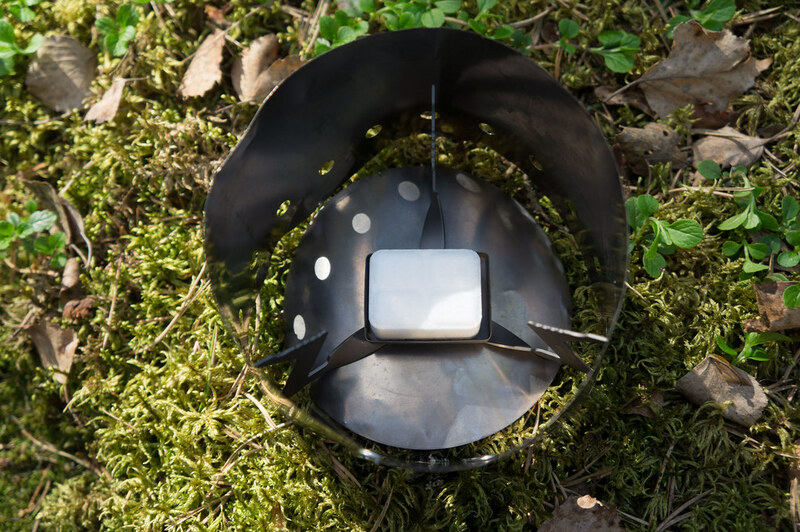 It shouldn’t be difficult to create a system that relies on an Esbit stove to stay under 100 gram total weight, but you most likely pay in that case also around $1 or more per gram. If the complete system route is what you’re after, get either the Lite Trail Titanium Solid Fuel Cook System or the Trail Designs Caldera Keg-GVP Stove System. The former has the benefit that you can use the pot also over a wood fire and it’s very durable, while the latter is lighter and larger volumne. The Sidewinder for the 400 ml cup is a combined solution of these two, btw. You’re Esbit-curious but don’t know if it’s for you? 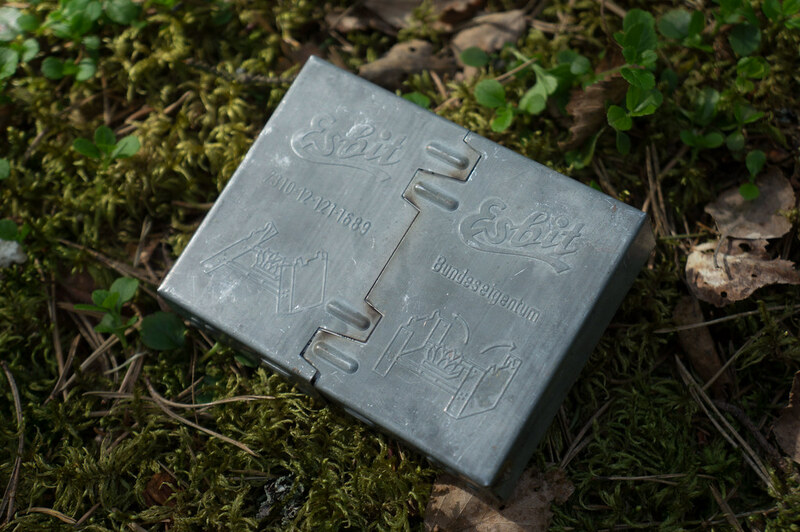 Get a Ti-Wing Stove or make your own, add a box of Esbit tabs and you’re set. This you can try with existing pots and cups, and see how it works for you. 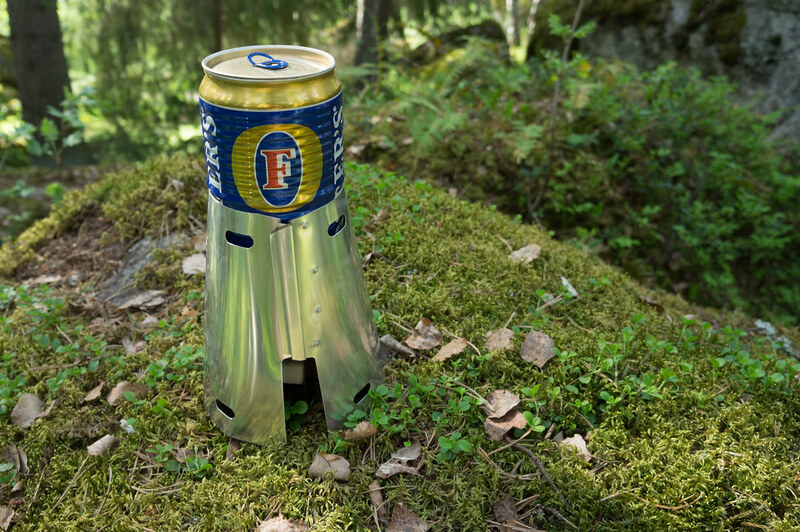 Another alternative is a Trail Designs Sidewinder system in which you can try Esbit, but also alcohol and wood - that way you’re not “locked in” in case you find Esbit is just not your cup of tea. After seeing how easy and convenient Esbit is, I’m giving it again a try. I love the tiny packsize of the whole system, the ease of use, and the simplicity. 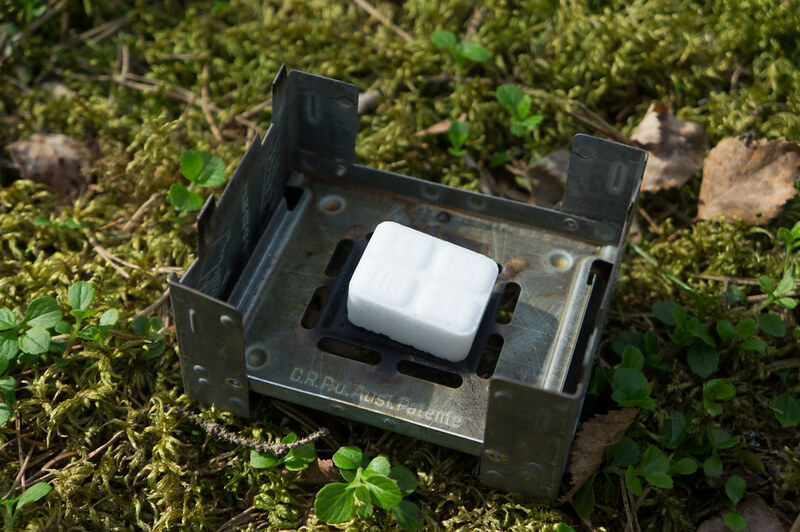 If you’re tired of hearing a noisy canister stove, leaking alcohol bottles, or that you smell like a wood fire, give Esbit a try. More photos of all stoves in different configurations. Brian really wants to like Esbit and has a MYOG tutorial on how to make a wicked light Esbit tray stove. 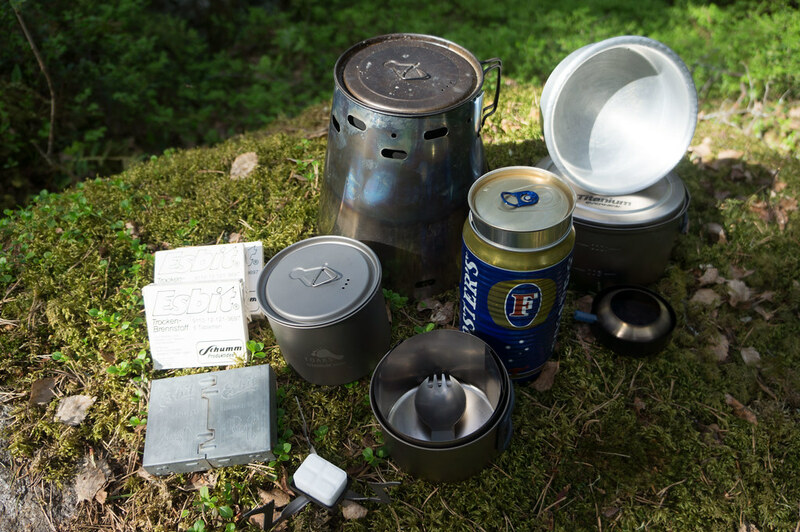 Chad discusses his SUL cook kit, John takes a look at the 2013 Lite Trail stove system, Tatsuya has a very detailed post on his Esbit/ wood stove system, and the mother of all goodness is of course the Esbit homepage. Ich habe fertig.